All that Yvonne Grap of Rosedale could think of as her husband drove her home from the eye clinic were her doctor’s instructions. To recover quickly from her recent eye surgery, the doctor said, the loyal Maryland Lottery scratch-off fan should keep looking downward. What could she do to pass the time in this pose, she wondered? Suddenly, inspiration hit. She asked her husband to pull over at the next Maryland Lottery retailer. 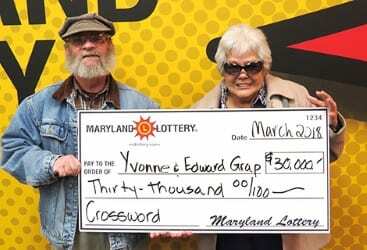 Her husband, Edward, spotted the Maryland Lottery sign in the window of Golden Ring Liquors in Baltimore and stopped at the lucky store. Yvonne sent him in with instructions to buy a handful of her favorite $3 scratch-offs – the Crossword game. At home, while abiding by her doctor’s wishes, the Rosedale resident sat at a table to scratch off her instant tickets. “On one of them, I counted eight words! That‘s a $1,000 winner!” Yvonne said. She called to her husband and asked him to recheck the apparently lucky scratch-off. He did and found one more word, making the instant ticket worth $5,000. The Crossword win comes at a good time for the family. They plan to focus their winnings on home repairs. The $3 Crossword game that delivered their $30,000 surprise debuted last July and now has six unclaimed $30,000 top prizes and thousands of others ranging from $3 to $5,000. Also benefiting from the big win is the lucky retailer. The Baltimore County retailer located at 8651 Philadelphia Road earns a $300 bonus from the Lottery for selling a $30,000 top-prize scratch-off.